Eileen and Ashley with the haul. Church Ward Councillors Eileen and Ashley alongside volunteers helped clean up Shinfield Road rec on a sunny July day recently. The Council provided the equipment and picked up the haul which included some heavy duty items dumped around the park. Councillors would like to ask residents help in keeping an eye out for anyone dumping or fly tipping at the park, if you see anything please let us or the Council know. We have also asked for additional bins at the park and enquired as to the viability of CCTV. If there is anywhere else across the Ward that you think needs the clean up treatment, please let us know. 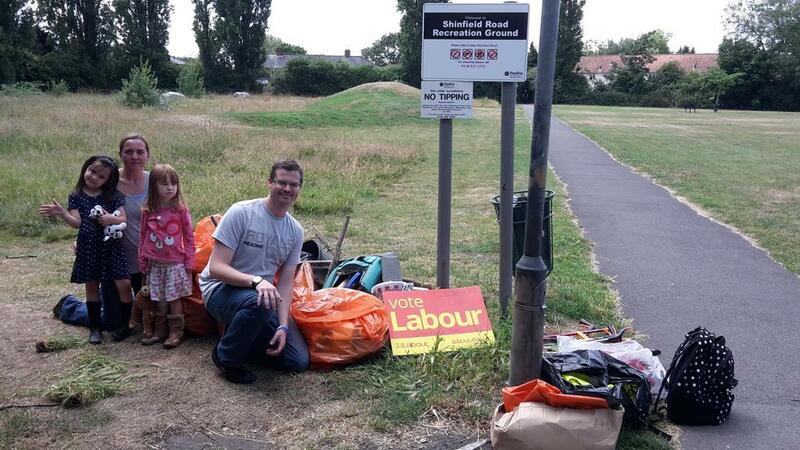 This entry was posted in Ward News and tagged Shinfield Rec clean up on July 4, 2015 by Ashley Pearce.